The Maxx 2 is the less expensive of Motorola's two new Droid handsets for Verizon Wireless, but it is still a competitive offering. 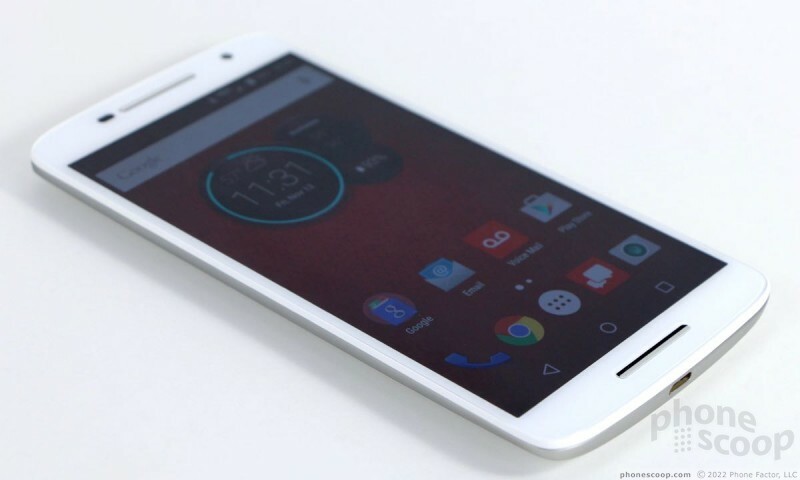 This Android smartphone impresses with excellent build quality and a battery that delivers on Motorola's promises. If you need an Android handset that goes the distance, the Maxx 2 should be at the top of your shopping list. Here is Phone Scoop's full report. 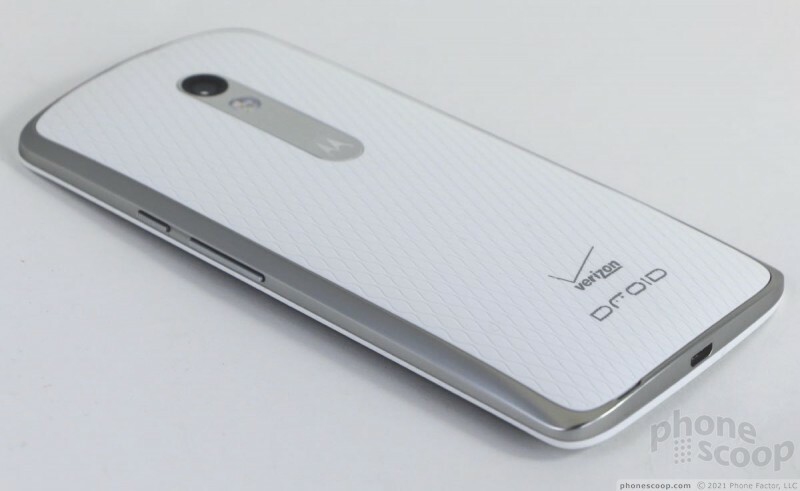 The Droid Maxx 2 is a significant update to the Droid Maxx and offers Verizon customers an excellent mid-range option to more expensive flagships. 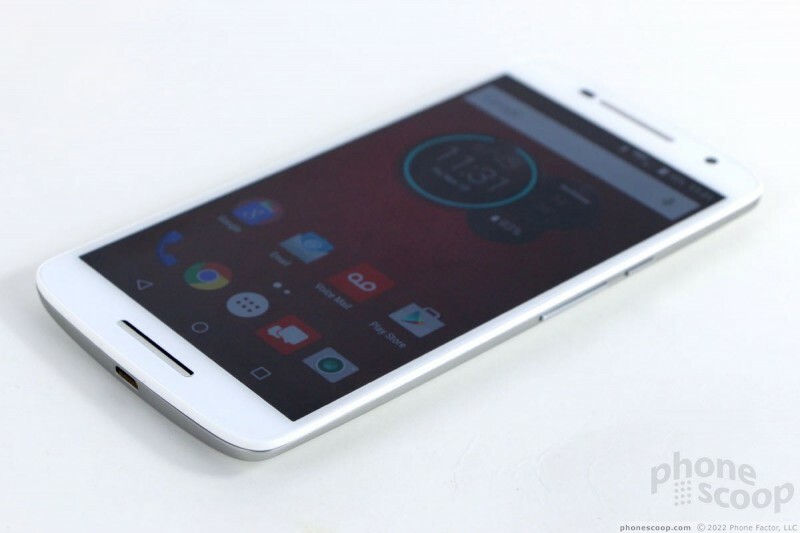 It boasts interchangeable rear panels, a huge battery, and rapid charging. If you're a fan of the Droid line, don't need the shatterproof Turbo 2, and desire unparalleled battery life, the Maxx 2 is worth a look. 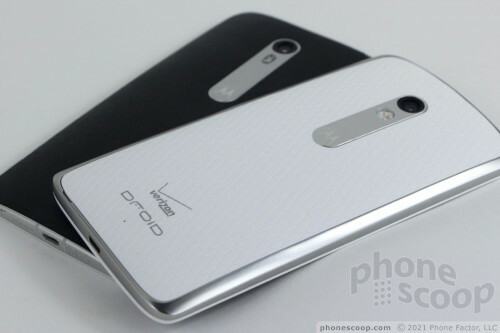 Pointing out the differences between the Droid Maxx 2, Turbo 2, and Moto X Pure Edition is tough to do from several feet away. All three phones share a significant number of design elements and features. 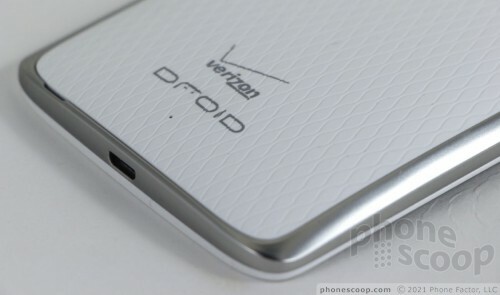 Perhaps the biggest giveaway is that the M2 doesn't have the stylized Verizon "V" logo on the front like the T2 does. Otherwise, you're looking at a trio of phones that can easily be mistaken for one another. The core design includes an aluminum frame along the outer edge, white/black glass panel on front, and selectable colors for the rear. The camera module is contained in a metal housing, and the edges are tapered a bit to help the phone fit better in your hand. 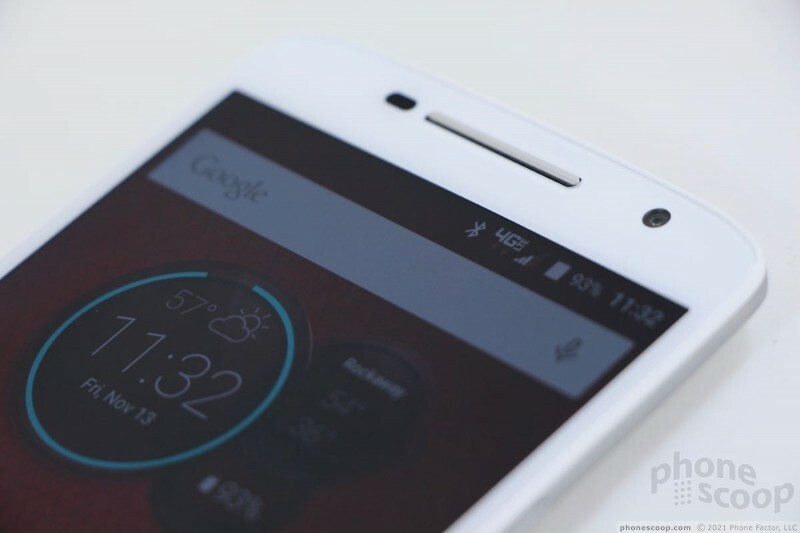 Motorola isn't giving potential M2 customers quite the same level of customization as the Turbo 2. It's not available via Moto Maker; instead, you can purchase the handset and opt for additional, interchangeable rear covers. There are seven to choose from. 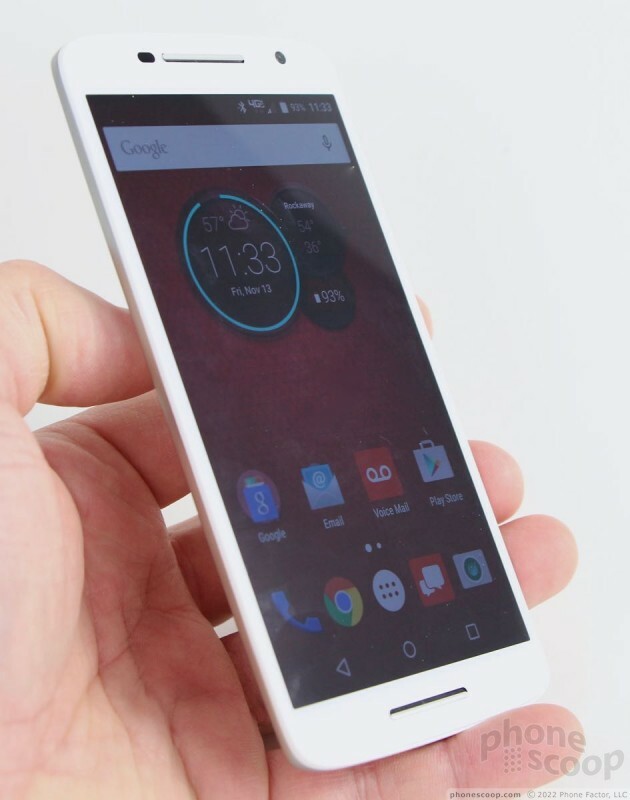 The Maxx 2 is a big phone, but not quite as huge as the T2 (those millimeters do count.) 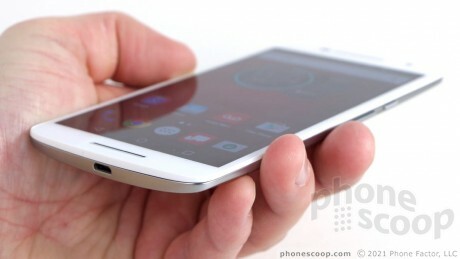 The display measures 5.5 inches, which puts it deep into phablet territory. It often requires two hands. I found it fits into pockets somewhat easier than the Turbo 2 thanks to the curvier contour of the rear panel. The Maxx 2 is actually 1.8mm thicker than the Turbo 2, but the shape is much slimmer at the edges, which helps tremendously. The Maxx 2 is just as heavy as the Turbo 2, which is surprising, given the standard display and slightly smaller battery. Build quality and materials are top-notch. Everything about the M2 is fitted tightly together. 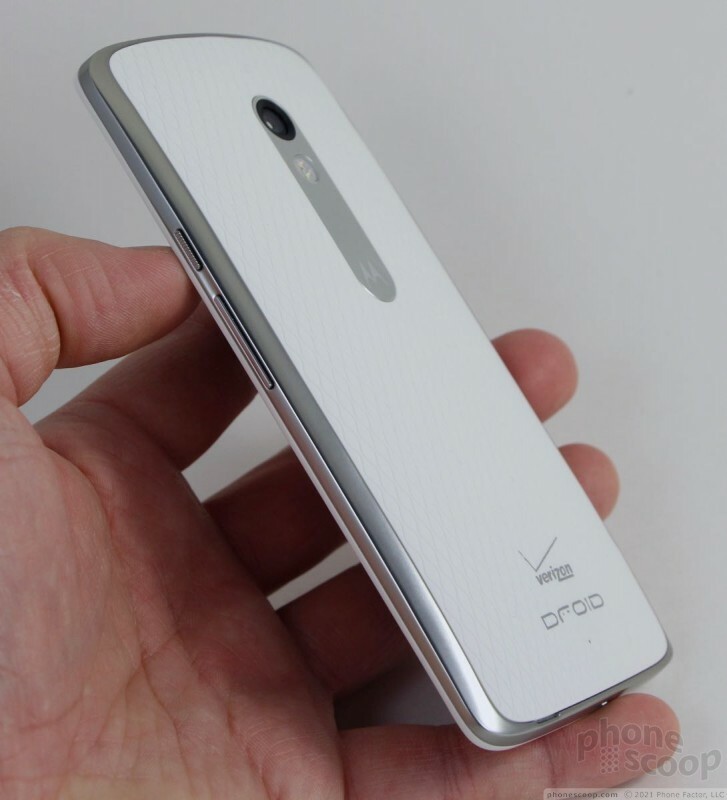 I like the combination of different textures (glass, metal, and soft-grip) and the phone feels very strong. The front surface is not too chaotic. 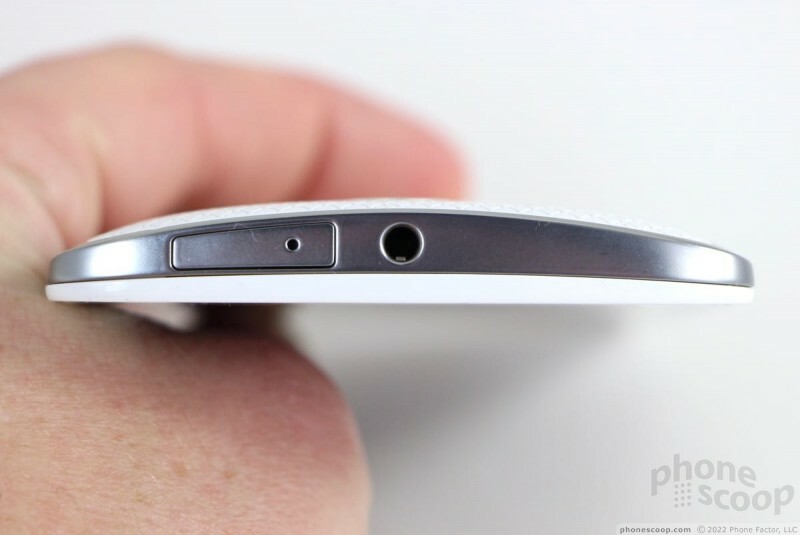 The Maxx 2's glass is curved slightly where it joins the side edges of the metal frame. This smoothes out the seam a bit. The frame forms lips along the top and bottom edges of the glass, however. 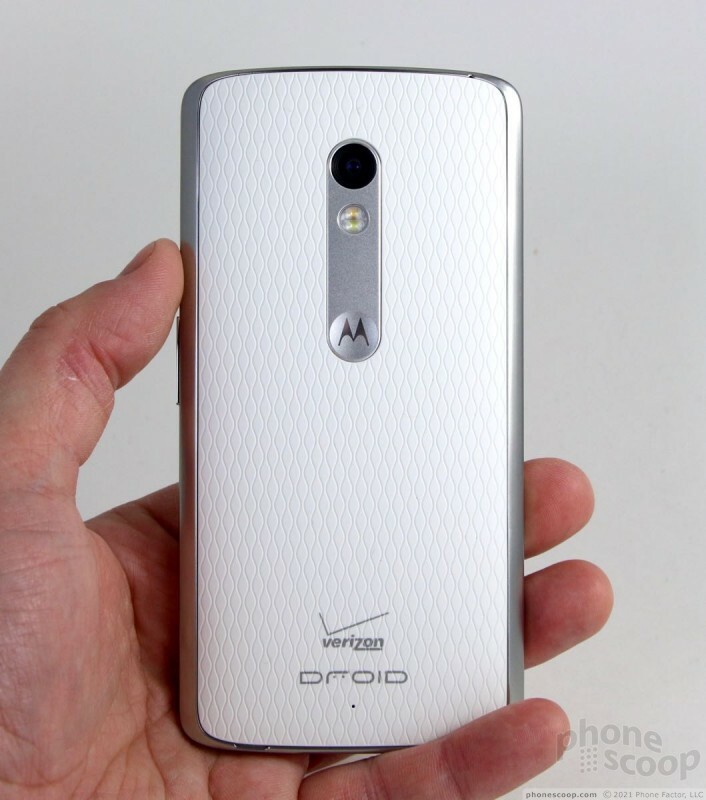 The overall feel around the edges is better on the newest Moto X. 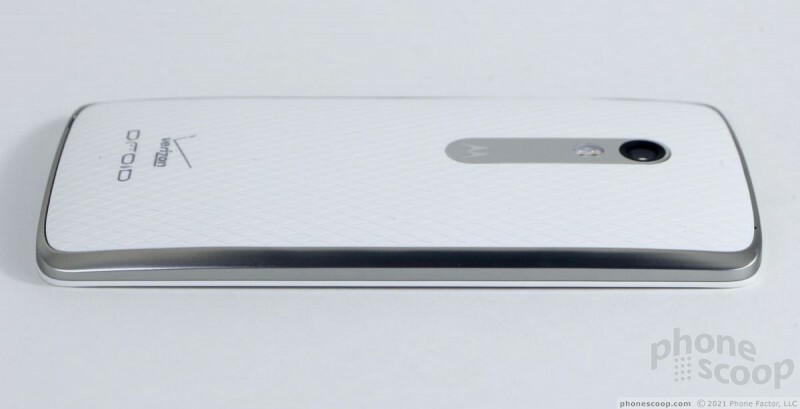 Above the display, you'll note the selfie cam, speaker grille, and a single sensor. A second speaker grille fills the space below the screen. There are no hardware buttons on the front of the phone. 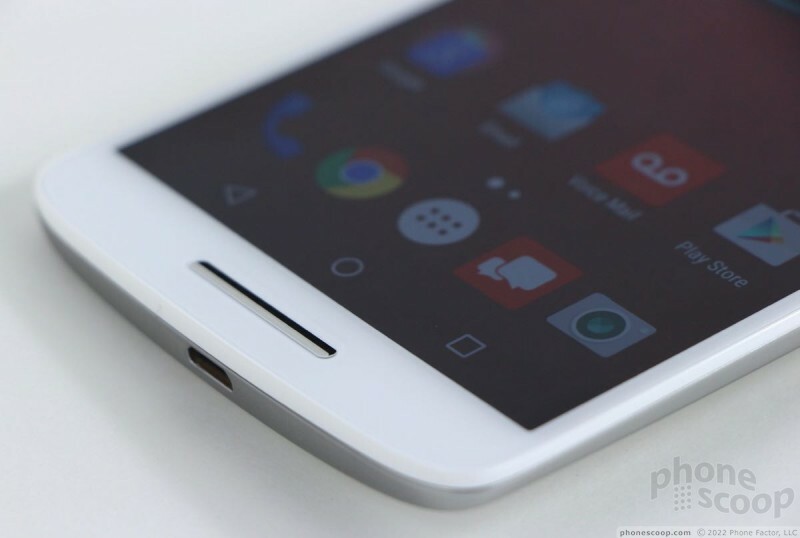 The screen lock button is located on the right side of the phone, within the metal frame. 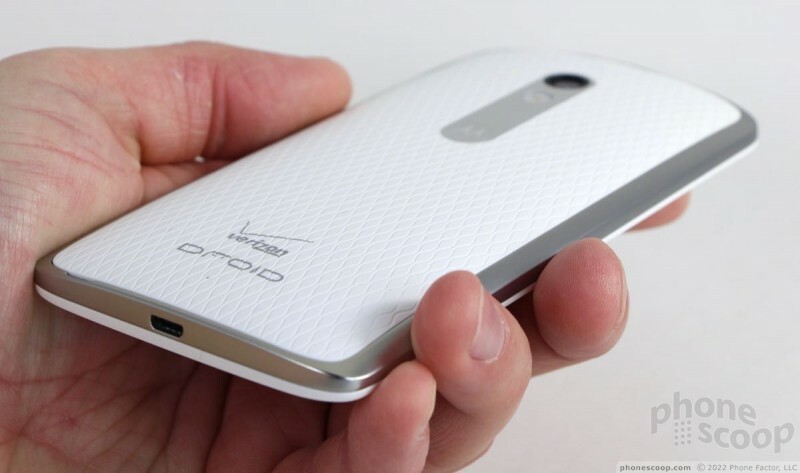 It has a nice, ribbed texture so it stands apart from the volume toggle, which is located below it. I like the travel and feedback of both these controls, but I thought the screen lock button was a little wobbly. I also wish the volume toggle were a little bit longer; that would make it easier to use. The SIM tray and headphone jack are on top. The SIM tray includes a slot for memory cards. The USB port is on the bottom. 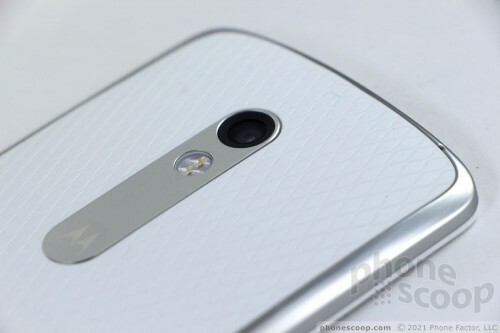 The Maxx 2's camera module closely resembles that of the Moto X; it is a metal ellipse with the camera lens at one end and the indented Motorola logo at the other. The two-tone flash is in between. As noted, the soft-grip rear cover snaps off in order to customize the look, but there's nothing accessible beneath it; the battery is sealed in tight. The panel has a wavy design on it that adds texture. I found I was able to hold onto the phone tightly even when going for a jog. The Maxx 2 is water-resistant thanks to a nanocoating spritzed across the phone's innards. 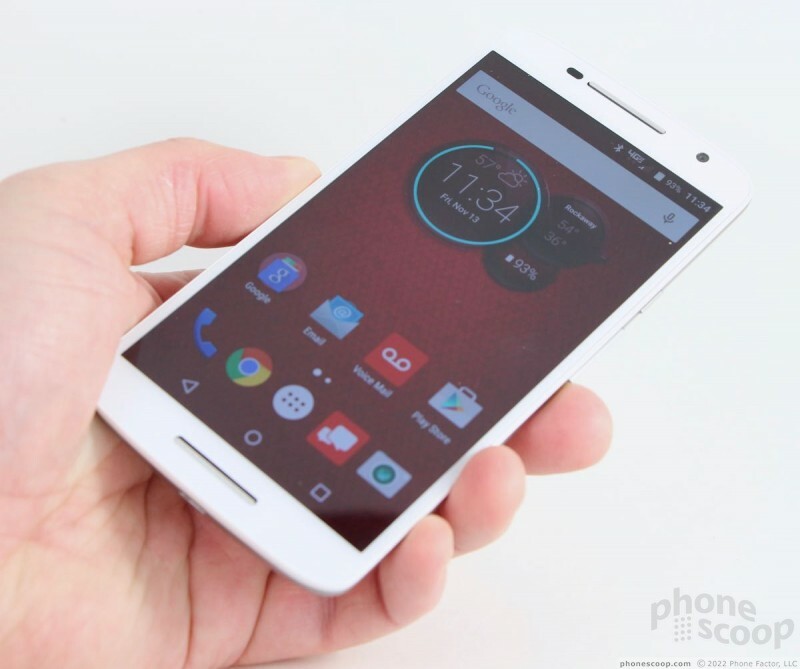 This is standard fare for a Motorola handset. It can handle sweat, rain, and some light splashing, but it won't be happy about going for a swim. Keep it out of the pool. The Maxx 2 is a fine piece of hardware. The biggest difference between the Turbo 2 and the Maxx 2 is the display. 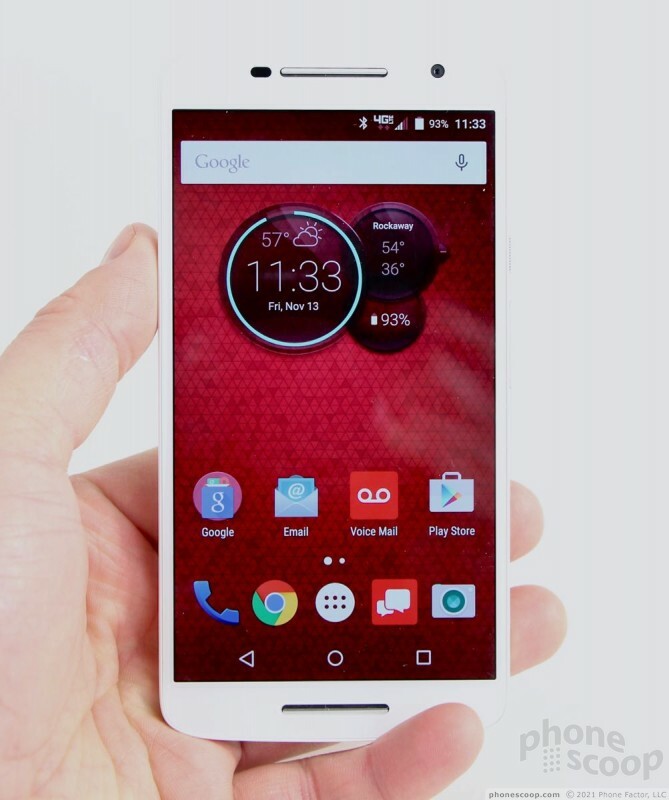 The Turbo 2 has a 5.4-inch, quad HD AMOLED screen protected by Motorola's ShatterShield. The Maxx 2 has a 5.5-inch full HD LCD panel protected by Gorilla Glass. In other words, the Maxx 2 has the more standard screen. The Maxx 2's LCD panel produces significantly more light than the Turbo 2's AMOLED screen, and even though it has fewer pixels, the M2's display is clearer and sharper to the naked eye. The Turbo 2's ShatterShield technology has negative trade-offs in brightness and sharpness. The result is that the Maxx 2's screen looks better, despite its technically inferior specs. I was able to use it indoors and out with no problem, and viewing angles are good for an LCD screen. The Maxx 2 maintained a tight connection to Verizon's network in and around New York City. The phone consistently connected calls on the first dial, even in areas with weak coverage. The M2 did not drop nor miss any calls while I reviewed it, and the phone kept a call going at highway speeds without problem. Data performance was solid across LTE networks. I was not disappointed with its performance and found the M2 great for everyday use when surfing the web, browsing through Facebook, and watching YouTube videos. The Maxx 2 performs at the same level most handsets do on Verizon's network. The Maxx 2 is a mediocre voice phone. When calls are made the old-fashioned way over Verizon's legacy voice network, earpiece volume was lacking and quality was muddy at best. I was able to understand calls in my home and stationary car, but coffee shops, restaurants, and other public spaces easily overpowered the anemic amplifier in the earpiece. I'd have been less disappointed if clarity was good, but it's not. The speakerphone is worse. Volume and clarity go downhill a bit. I was not able to hold a conversation in a moving car, for example. Things improve a bit when you connect calls over LTE using Verizon's HD Voice service. Earpiece and speakerphone volume isn't any better, but clarity is much better. In order for HD calls to work, both parties need to have LTE coverage and Verizon's Advanced Calling app on board. Ringers and alerts are good enough, and the vibrate always got my attention. 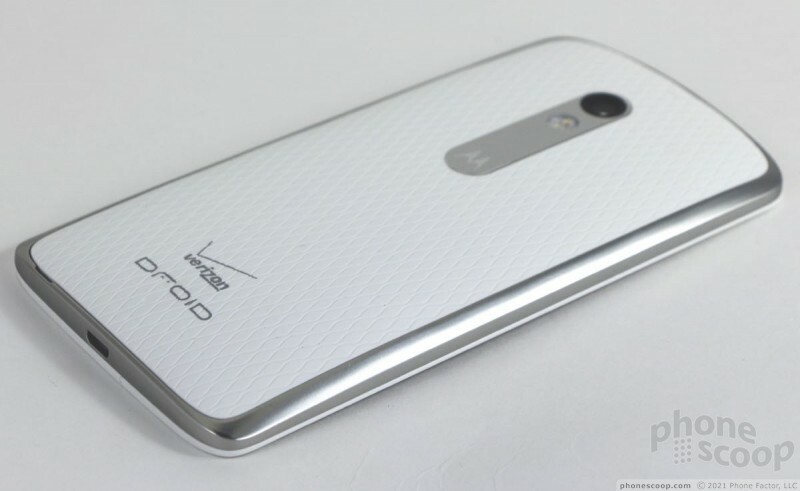 The Droid Maxx is called the Droid Maxx because it offers maximum battery life. The phone has an incredible 3,630 mAh power supply. While that's a bit smaller than the Turbo 2's battery, the Maxx's less-hungry processor and lower-resolution screen help deliver better battery life. Motorola claims the Maxx 2 can remain up and running for 48 hours. According to my mixed usage tests, that's about accurate. It easily outlasted the Turbo 2 by 4 or 5 hours. The Maxx 2 lasted from breakfast one day to bedtime the next. This is about as good as you're going to get from any modern smartphone. The M2 supports rapid charging, but not wireless charging. The TurboCharger that ships with the phone can deliver 7 hours of battery life in just 10 minutes. In other words, the M2 doesn't need to be plugged in all that often. 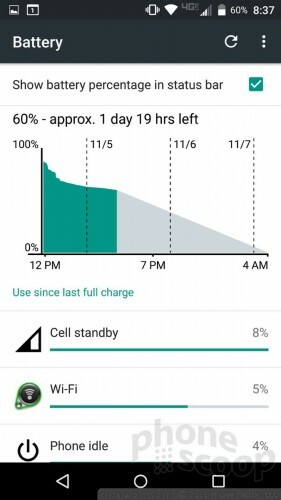 Motorola didn't bother to give the M2 an advanced battery saver tool; instead, it ships only with the Android system battery saver, which can be controlled manually to reduce power consumption. The M2 includes the usual selection of radios for connecting to various devices and networks. The Bluetooth radio functioned perfectly as far as pairing with and connecting to speakers and headphones was concerned. Calls were pretty rough via Bluetooth in my car. Music sounded good through my favorite Bluetooth speaker, however. The NFC radio worked great for aiding Bluetooth pairings. Together with Google Maps, the M2's GPS radio located me quickly and accurately. The WiFi radio didn't give me any trouble whatsoever.